With the Conflow Code 39 - Ball Stop Valve fluid flow in a pipeline is completely stopped by turning the handle through 90°. 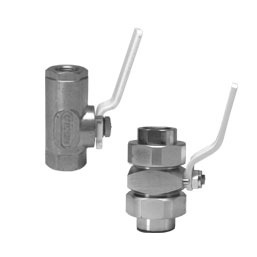 The main benefit in using this type of valve is its full bore capacity, i.e. when the valve is open the inside diameter of the valve is the same size as that of the adjoining pipe work, so that the pressure drop across the valve is negligible. High quality components - CNC machined brass forged main body, stainless steel ball and Delrin ball seats ensure easy and reliable operation, tight shut off, and high pressure rating.